It’s not easy being good looking (not that I would have first hand knowledge). If the first thing you provoke in onlookers is envy or jealousy, that can be a problem. MV Agusta makes good looking motorcycles, and they have done so for more than a decade now since the brand essentially relaunched. Always good looking, but not necessarily functioning up to the same standard. MV Agusta considers itself a “super premium” brand, and it has had the aesthetic design and detailing to back up that claim. 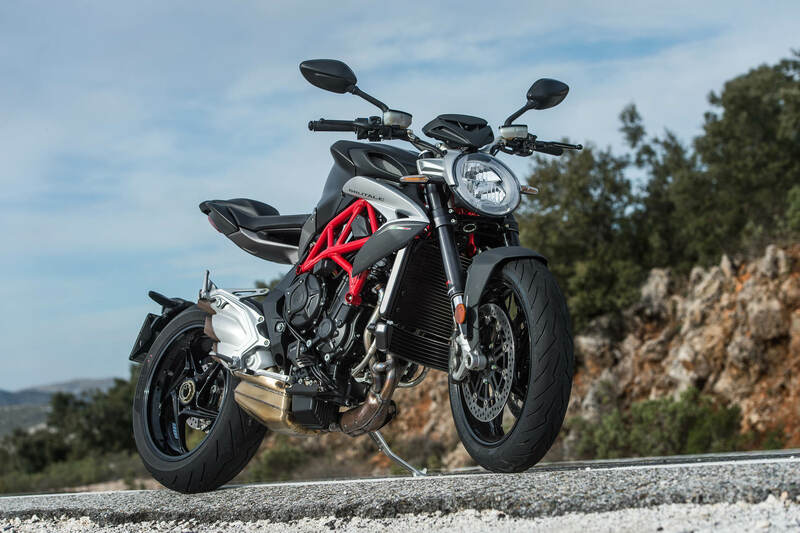 Having ridden the new MV Agusta Brutale 800 in southern Spain late last week, I have concluded that MV Agusta now has the function and performance chops to match up with its beautiful design. That’s saying a lot, as I will discuss below. The MV Agusta Brutale debuted 15 years ago in 2000, and was either shocking or gorgeous, or both, depending on your perspective. At the time, the unique shape of the head lamp was something that really caught your eye (it has since been copied), and the four-cylinder engine in the original promised great power for a naked. MV eventually made three-cylinder models, and ultimately 800cc versions of those triples. MV had some teething problems early on, as many brands do when they reinvent themselves, and fuel injection mapping was certainly one of them. MV ultimately sorted this out, as we discovered when we track tested the 2014 F3 800 here in California. 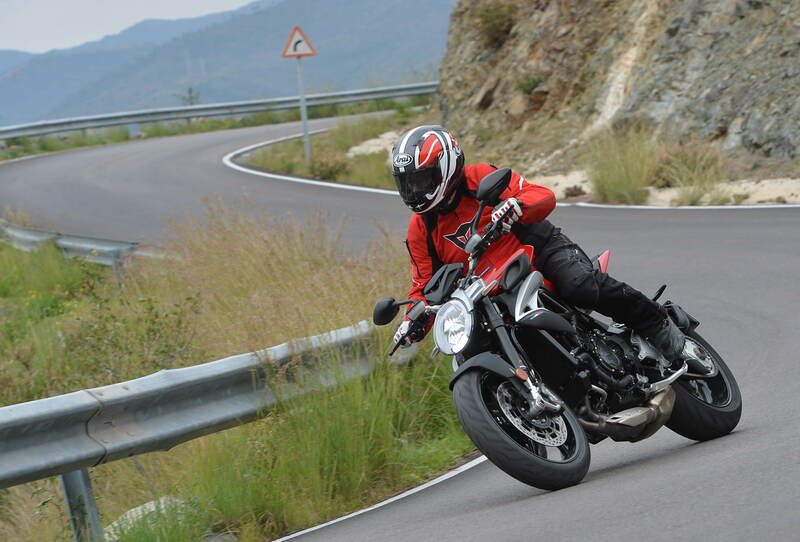 So I was expecting the all new Brutale 800 to be well sorted when I arrived in Spain to test it last week. Before we get into my riding impressions, let’s talk a bit about what is different from past Brutales. MV Agusta considers the new Brutale 800 a complete redesign, and it really is when you dig into the details. The distinctive headlamp, single swingarm and triple exhaust exits look somewhat similar to the outgoing model, but everything is new. Everything is at least subtly reshaped, but the tail section jumps out at you. It is a minimalist design, and the see-through support for the tail section is immediately obvious. The headlamp is even different from the outgoing model, appearing thinner and more elegant. The frame is different as well, with a wheelbase 20mm longer and increased trail. The suspension includes a 43mm Marzocchi fully adjustable fork, as well as a fully adjustable Sachs shock that works through a linkage. Four-piston Brembo calipers and 320mm rotors up front work with a single 220mm disc at the rear. Bosch provides the advanced ABS system, and new wheels are shod with Pirelli Diablo Rosso III tires. The three-cylinder engine gets revised cam timing, new pistons and redesigned intake and exhaust systems complying with Euro 4 standards. A slight decrease in peak horsepower is coupled with a much broader and smoother torque curve, providing much improved acceleration at lower and medium rpm levels. Ninety percent of maximum torque is available all the way down at 3,800 rpm with 116 peak horsepower up at 11,500 rpm. 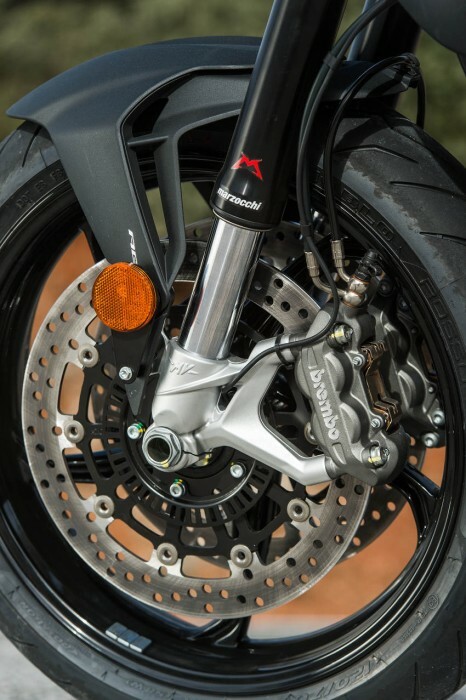 Characteristically, the Brutale 800 engine features a counter-rotating crank intended to reduce inertia when changing directions. Both the slipper clutch and brakes are hydraulically operated. Sophisticated electronics also provide clutchless up and down shifting, as well as eight traction control settings and three selectable fuel maps. The maps include Sport, Tourismo and Rain, which provides progressively smoother power and reduced peak power (Rain mode only offers 80 horsepower, for instance). A fourth map is labelled “Custom” which allows the rider to customize engine behavior by changing various parameters (which we did not have time to experiment with). 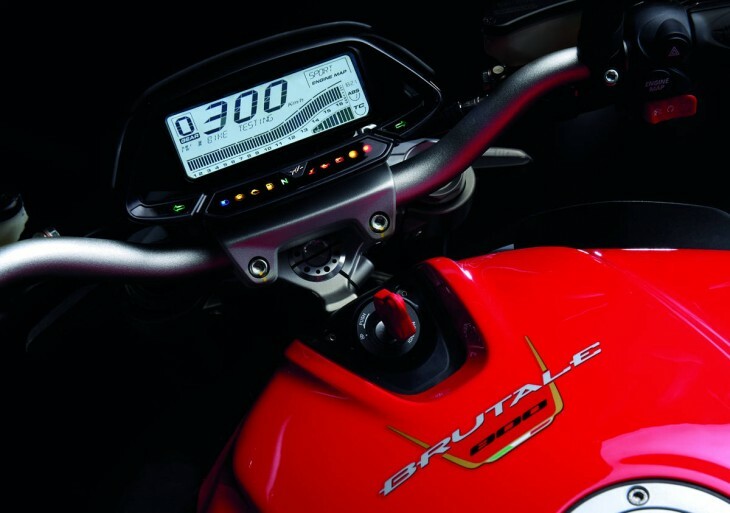 MV Agusta claims a dry weight of 385.8 pounds before filling the 4.4 gallon gas tank. Not the lightest naked around, but pretty light given the engine displacement and performance on offer. But we weren’t in Spain to look at the Brutale 800 or examine its spec sheet. We were here to ride the bike in anger up the famous Ronda Road in the Malaga region, which includes a series of fast sweepers climbing a mountain just outside Marbella. 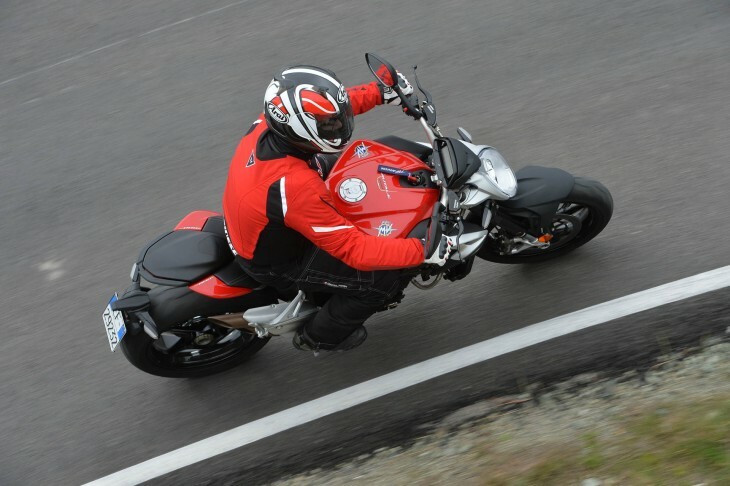 More than 20 miles long in one direction, we ascended and descended the road following an MV Agusta test rider who happened to be a former superbike racer. The pace set was essentially “as fast as you can go” except for one or two journalists with racing backgrounds, themselves. A stunning road, in more ways than one. But more about that later. As I sat on the new Brutale 800 for the first time, the position felt comfortable and relatively neutral. Not quite as upright as some nakeds, perhaps, but the bars were still high enough to keep weight off my wrists, and allow me to keep my head elevated without any neck strain. The rider triangle, including the distance between the seat and the pegs, made sense for a bike that could serve both as a commuter and a weekend canyon scratcher. The seat was comfortable, and continued to be so throughout the ride of approximately 100 miles. Riding hard through the sweeping turns of the Ronda, ergonomics worked very well. The slight lean forward made me feel more engaged through the corners. MV Agusta has focused hard on throttle response and fuel injection tuning since the time that it’s earlier bikes stumbled (both literally and figuratively) in this category. As a result, throttle response on the Brutale 800 is outstanding … as good as any modern fuel injected bike we have tested in the last few years. Aiding the smooth and precise throttle response is the torque curve of the new engine. This bike pulls smoothly, and with good thrust from very low rpm levels. While on the Ronda, I was able to exit corners, more often than not, in any one of three gears without significantly impacting acceleration. One of the widest power bands I can recall, and with the relatively large displacement, the triple never felt lacking. The bike cannot only pull from low revs, it continues to pull until the rev limiter cuts in. Opening the throttle mid-corner to drive out the other side did not upset the chassis whatsoever. Bottom line, the MV Agusta Brutale 800 made for a fantastic mount on the Ronda. The fully adjustable suspension was fine set “as is” for the press launch. I didn’t touch the settings, and I don’t recall any of the other journalists mentioning that they wanted any changes to the fork or shock. Riders from 150 pounds on up (yours truly is currently 210 pounds) all seemed pleased. The bike is well balanced and supple enough to provide a decent ride over rough city pavement, while still holding itself high enough in the stroke, and providing sufficient damping, to deliver a very confident ride through twisty mountain roads. The bike would even work well at a track day for most riders, in my opinion. The Pirelli tires started out feeling a bit stiff and slippery when we first left the hotel parking lot and traversed the damp morning streets of Marbella on our way to the Ronda. Soon after hitting the twisty roads, however, the tires began to deliver great grip and confidence. I found excellent feedback, particularly from the front tire. The rear end was also well planted, and aggressive throttle on corner exits never caused the back end to step out (although I did feel the rear end slide when I hit a painted stripe with a big lean angle – my mistake, frankly). The six-speed transmission worked flawlessly, and the clutchless up-shifts and down-shifts ( which are automatically rev matched) made everything that much easier. All of the electronics seemed invisible to the rider, including the ABS brakes and the traction control – a sign of excellent engineering and testing by MV. The brakes had awesome power and good feel, and even forgave the occasional ham-fisted application by yours truly. Semi-panic deceleration also kept the chassis remarkably composed and ready for corner turn-in. In addition to nimble handling, the Brutale 800 tracks well in a straight line at high speeds with no nervousness. 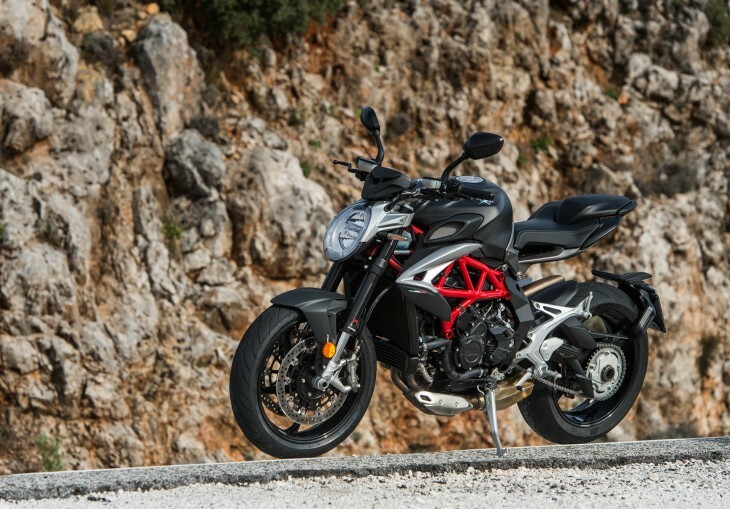 In general, the Brutale 800 is both fast and easy to ride, achieving one of MV Agusta’s goals, which was to make the Brutale 800 accessible to lesser-skilled riders. Frankly, I loved the engine and the spread of power, which seemed almost perfect for street use. Picking nits, I found the rear brake a bit touchy, and willing to lock on occasion despite the ABS. This only happened at lower speeds, and I suspect it was a combination of brake application and lean angle in slow, slippery corners. I am also not a fan of a digital tachometer, although the rest of the instrumentation is both legible and useful. 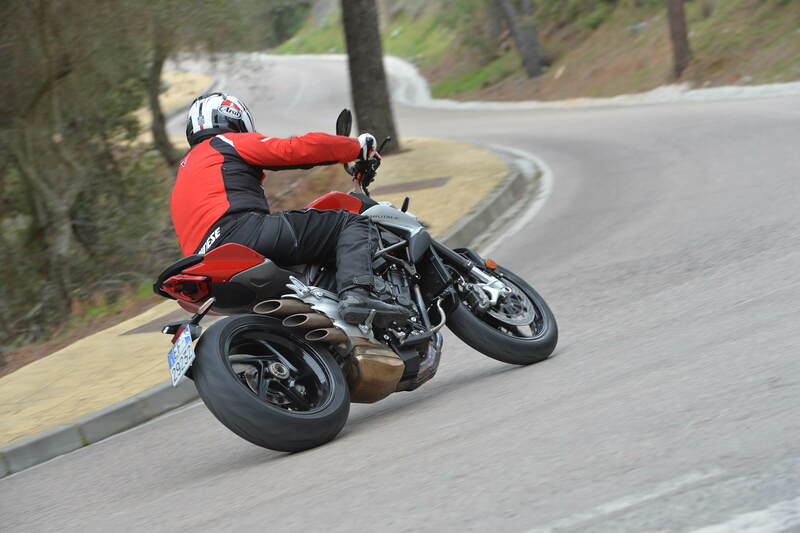 In the end, our first ride on the 2016 MV Agusta Brutale 800 left us very impressed. This is an extremely refined product not only aesthetically, but from a performance and function perspective. This bike works as good as it looks! The intoxicating howl of the triple didn’t hurt. At a U.S. MSRP of $13,498, the new Brutale 800 is by no means inexpensive, but you are getting a premium design together with a premium riding experience. Take a look at MV Agusta’s web site for available colors, as well as additional details and specifications. Id swap my mt09 in a heartbeat if they didn’t have a reputation for giving you a head ache when it comes to reliability. Just looking at it gives me a sticky tip! I wonder if they fixed the “flaking” cams on this version of the 800 motor? Under 5000 miles on my 800 and the cams went bad. Same thing happened to another guy that owns a Rivale 800. Flaking cams are back, same as the early F4’s! Check your cams before your warranty is up! Over $1000 each if you have to purchase them yourself! Goofus-looking ergo-nightmare. No utilitarian use at all. I would like to read their marketing studies to see how they justified pouring company capital into producing that thing. LOL it’s a boutique bike marketed to those who want exclusivity, not meant to be utilitarian or particularly comfortable. No MV in the last 40 years has ever been an everyday bike marketed to the masses that I can recall. Agree with both of y’all. It’s sort of like Lady Gaga’s meat dress. It gets press; gawk at it’s weirdness, but what use is it? And, how can the company sustain itself producing such shock-value items for sale? A quandary, for sure! That’s a little unfair. It’s not like MV’s are unusable in the real world. Sure, they’re not “practical”, but if you can afford one, they’re pretty nice bikes. companies like Motus and MV are too small to do ordinary. They have to go for something so wildly different that the small market they appeal to is willing to pay more and to seek them out. They can’t afford to compete with Japan making the same product or they will get crushed. Make a few, for the few, and charge them enough to make it worthwhile IS their marketing plan. Actually, their justification has likely been none other than the fact that the Brutale is now the lifeblood of the company. The newer 675/800 models of Brutale have increased their sales by a significant margin. This is also likely why we’re seeing a restyle/refinement of a model that was just introduced for the 2013 model year. Meanwhile, the bigger 1090 model has been pretty much the same since 2010 (with minor model reshuffling in 2012), and the F3 also remains pretty much the same. I also fail to see how this is an “ergo-nightmare”. I’ve ridden naked bikes for most of my riding career as well (it’s rare for me not to have one in the garage), and while not as roomy and upright as your run-of-the-mill touring bike, it’s hardly the torture rack that the “F3/F4/every other sportbike existent” is. I’d gladly ride one everyday. Sam said “Where are the many Dealers that are spread out all over the United States, that could provide timely service after the sale? The “Exotics” lack the support that gives me comfort when on the road. JAP and YANK dealers are everywhere on every other street corner. This is 110% TRUE. We have I believe TWO Dealers in Georgia. That’s right TWO. Even though one of those dealers is 5 miles from my house I’d have a hard time justifying the purchase of one of these bikes. If MV wants to INCREASE their sales potential they need to provide outlets for SALES/SERVICE. Short story. We had a multi brand dealer here in Georgia that sold MV, Aprillia and Suzuki that recently closed its doors. Several customers bought Aprillia bikes there and now have NOWHERE IN STATE to go for service/parts or repairs. MANY–myself included–have the same worries about a boutique manufacturer like MV Augusta. NO after the sale service. For me, Like SAM–case closed. I agree, it’s no question. For a bike that is going to be transportation, when you’re thinking about a next bike you have to consider who your favorite/closest/most reliable dealer is. It’s simply part of the package. For collectors or when a bike is your 4th, 5th, 6th, ok, maybe having a dealer a few hours away isn’t the end of the world. But I don’ think this is the case for most of us. Man, you are in Ohio correct? It’s not like we are talking about Wyoming here: Ohio is a pretty populated state. I know we have one MV delaer in each of the four big metros here in TX. Maybe there are more elsewhere in the state, but I doubt it. In twenty years of owning bikes, I’ve never taken one to a dealership for anything other than a recall or warranty repair. In fact, several recalls and warranty repairs I’ve handled myself because I just can’t get over this backlog of work that my dealers always seem to have that means I need to leave the bike with them for a week. So dealer presence frankly carries zero weight in my decision to purchase a motorcycle. Jeremy in Texas said “In twenty years of owning bikes, I’ve never taken one to a dealership for anything other than a recall or warranty repair. In fact, several recalls and warranty repairs I’ve handled myself because I just can’t get over this backlog of work that my dealers always seem to have that means I need to leave the bike with them for a week. So dealer presence frankly carries zero weight in my decision to purchase a motorcycle. This is very commendable that you are able to do your own maintenance and repairs–BUT–as bikes become more and more sophisticated with ride by wire throttle control, ABS brakes, multi ride modes etc it will become increasingly more and more difficult to perform home maintenance other than plugs, air filters and oil changes. The specialized equipment to diagnose and repair the current bikes is Very Pricey and also requires extensive training to operate these pieces of equipment. How many of us have access to this type of equipment, can afford to buy it, or know how to use it. This is why with a NEWER bike the dealer network and one day possibly the need for repairs etc becomes so important. The dealer that carries MV down the road from me has gone so far as to quote their shop rates by the HALF HOUR in order not to shock the consumer. ($94/hr). Typical labor rates are $70-80 at the Japanese brand’s shop. The newer bikes have become like the current autos–only a fully equipped dealer can do service on a current bike. Coming full circle I’d say if you are considering a NEW bike then you had better consider service and the accessibility/ availability of that service if you plan to have your bike running long term. Hi Rick. I know shade tree diagnostics and repair isn’t for everyone and wasn’t implying that it is a replacement for a knowledgeable dealership. In fact, time is not something I have in excess and would prefer if I had someone else to fix my bikes regardless of how much it costs. However, after years of watching my friends just throw money at dealerships to never get the problem resolved and just seeing some of the terrible work even on basic maintenance coming out of dealerships, that is nowhere that I want to take my bikes. I know there are good ones out there, but guys I know spend a lot of money and a lot of time not being able to ride their bikes trying to find them. Concerning your comment on the difficulty of working on newer models… My most current bike is a 2014, but I’ve been dealing with fuel injection, ECUs and ABS for 15 years now. Bikes are easier to fix now than they have ever been as far as I’m concerned. The newest gizmos like ride modes and traction control are really no different – a set of instructions designed to deliver a certain output based on certain input variables. My tool box may look a little different than the guy’s that owns that old Norton as mine includes a laptop and several interface cables, but it gets the job done all the same. Even so, I know that I am no electro-mechanical genius when it comes to working on bikes (barely above average most likely); and if I find myself in a bind, I just turn to the most powerful diagnostic tool known to man – Google. If worst comes to worst, I can blindly throw parts at my bike until the problem is resolved just as easily as my dealership can. I do a lot of touring. Dealer network is important to me, as is an owners network like the ST forum has. There used to be a lot more MV dealers around – there’s not even one in metro Phoenix any more! – but from what I’ve seen, they’re apparently trying to imbed MV into Mercedes-Benz dealerships around the country. I know a lot of Ducati dealers were carrying MV, but that may have been a sticking point for Ducati. MV probably can’t stand alone as its own brand, so the link to Mercedes may be the key. Where are the many Dealers that are spread out all over the United States, that could provide timely service after the sale? The “Exotics” lack the support that gives me comfort when on the road. JAP and YANK dealers are everywhere on every other street corner. The design looks like most modern motorcycles. Take it or leave it. SV650 is more toned down, but it’s looks don’t inspire much more then boredom. It’s a good cheap, ok mass produced, bike though…just so vanilla as to be completely uninspiring. This is a class or two above in every way. I’m ready to make the switch. Ducati has continued further down the wrong path for years. Meanwhile the MVs have been consistently marvelous. Give me a bike that doesn’t require some thin explanation about passion and style for me to love it. The MV is there…has been for years, I just put my loyalty in the wrong place. Are those tank air scoops functional? If I didn’t live in an area where nakeds are fairly useless, I’d be on the phone now. Good looking bike, and the main knock against it previously was horrible fuel injection leaving an on/off throttle. If that’s solved this is perfect. How about a sport touring or adventure version? Something with weather protection. Wow, that thing is hot. Err… the Multistrada that they’ve been making for more than just a couple years now? And now, there’s even an ‘Enduro’ version of that. Doh! Wrong thread! My fault! Mr Vrooom, what is is it about where you live that makes nakeds useless? I live in the high desert where it’s either really hot or freezing cold. Not much rain though. I have always loved the looks of the MV Brutale, so now that it performs as good as it looks, I could digest the price tag. In reality it is not an over the top price, when compared to other European bikes. The only issue I have is the thin dealer network. Who owns MV Agusta now? Isn’t is Mercedes-Benz AMG? I thought they got it back for $1 and partnered with Mercedes AMG which has 25%? Just like owning a exotic car, expect less reliability, expensive and scarce service, little or no aftermarket goodies and a big depreciation hit. If you can afford 2+ bikes and go in with your eyes open it would be a great conversation piece if that is high on your priority list. I’ve owned two Ducati’s just because of the “depreciation hit”. Excellent lovely bikes! Sign me up. Life’s too short not to ride Italian. Wasn’t Marzocchi supposed to be closed to motorcycle business (MTB suspension was sold to Fox)? I understand that Marzocchi fulfilled their OE contracts for 2015. So I imagine the 2017 Brutale will be wearing different suspenders. The SV650 seems so much more appealing to me. This looks more like a junior high cartoon than a sophisticated motorcycle. I guess it’s just begging for attention. Even so. While a -40+40 SV650 would look good on paper it’s hardly necessary. I’ve seen so many well riden SVs out-performing many higher spec/more powerful bikes. I’d rather beat someone on an MV while riding an SV than dismount the MV having to make excuses for its looks and my performance. Comparing an ace on a SV650 to a casual enthusiast on a Brutale is like comparing a Budlight to a glass of Chateau Lafite: you can make the comparison, but it doesn’t make much sense to do so. Were I the buffoon on the Brutale, I wouldn’t need to make excuses for anything. I would just appreciate that rider’s skills. Same way I can appreciate someone’s ability to funnel a Bud while all I can manage is to casually sip at my Lafite. No excuses necessary, just ride what you want and have fun. I could care less of what others think of what I ride and whether they could beat me or I could beat them. To what, the next stoplight? I wasn’t really thinking racing, more build quality, sound, engine power, and the totality of it all. I’ve ridden a couple SV650’s, and while it might be a decent bike for a lot of things, it’s pretty forgettable. I don’t do surface street stoplight racing. Leave that to the cruiser guys. From what I’ve seen, there’s no such thing as “fast bikes”, that’s all just spec sheet racing. There are fast riders, no matter what they ride. If I’m going to be a fast rider, I want to be on a “slow” bike – because I’m still riding just as fast. If I’m a slow rider, I want to be on a “slow” bike that is appropriate for my skills. There aren’t many fast riders and no one wants to be a slow rider on a “fast” bike. That’s just being a poseur and it’s not going to improve his abilities. First, become a fast rider, then get a “fast” bike if you think the bike would somehow improve your skills. I can ride any bike I want. Naturally, and like most people, I’d rather ride a gorgeous screaming Italian bike than some old suzuki POS. If I was going on a track maybe I’d have a track bike. But I just ride for fun, and part of that fun is the bike. Judging by (assumed) sales numbers and the number of SVs I see every day, I’d say most people would rather be on a Suzuki (or Yamaha for that matter) than a juvenile looking MV. Todd, I agree. If 100 people pass this motorcycle, parked in front of a Starbucks, maybe 1 of them would say “nice-looking bike”. The other 99 would walk away quickly, based on their uncertainty of what they just witnessed. I would never call this bike good-looking. Weird, yes. You could buy a new FZ-09, upgrade it to the point of equaling the performance of the Brutale 800 and still have two-three grand in your pocket. Having said that it would not be the rolling piece of art that the MV is, and resale would be a whole lot less. What a beautiful bike. I am waiting for a review of the 2016 dragster RR with 140HP on tap. Except you have an uglier bike and have to go out of your way to spend money and time to upgrade it. It’s a nice off the showroom floor package. You also don’t get sophisticated electronics (atleast in the US). In that same regard one could take a Mustang or Camaro for example and massage them so they have the same performance as a (insert exotic car here) but it wouldn’t be the same vehicle. Except for the heinous exhaust, it’s a pretty good lookin’ bike. Another udder, musta got some input from Yamaha. It does look like a bed pan, I think a chin/belly fairing would help it’s looks. All things said, I still think it’s a beautiful machine. I’m just gonna say it….UGLY! What a shame, there are many great bikes that look like transformers and have zero flow of design. Who decides that this looks good? Ok, I’m older but this thing….really?? Puke! Looks like it was already crashed..
Don’t get me wrong….I love (most) Italian motorcycles, but this looks like parts bin barf IMHO. Can you spell “metallic insect” styling? Like the idea of the up down shifter – seems to be the way of the future. Wonder if it can match the legs of the FZ-09/MT-09/ etc? Maybe Yamaha can see enough “Daylight” in between the FZ-09 and this Brutale…. That doesn’t mean I think it is ugly as I didn’t think the Gladius was an ugly bike, but it doesn’t really stand out in the field to me other than having a couple of unique styling cues. It could also look much better in person. Yeah Jeremy, I agree. Kinda Gladius Night and the Pips. A little busy looking with the scoops etc etc etc. Ooooo…now there’s an idea. Good thought, Mickey! Maybe with provisions for hard bags – good sport-tourer? Sip a few more Chateau La-whatevers and maybe you’ll get to like it more. Looks like great engineering but I don’t think they will ever be able to sell those looks as ‘refined’. More like ‘outrageous’ to me. But that is purely subjective I know. I keep hoping that some day motorcycle companies will ditch the futuristic ‘Flash Gordon’ approach and learn to design motorcycles more for people who actually ride them instead of for people who play with them. And what’s wrong with designing motorcycles for people who do both? MV seems to be doing fantastic work at approachable prices these days.